Synopsis: The adventures of a young woman living in Northern California for a year take place in Lady Bird. In front of the camera, Greta Gerwig has proven herself to be a powerhouse of independent cinema with show-stopping and scene-stealing performances in movies like Mistress America, 20th Century Women, and Maggie’s Plan. Now, audiences get to see what she can do behind the camera with her solo directorial debut Lady Bird. Quite simply, Lady Bird is the story of a young girl named Christine McPherson, who calls herself Lady Bird (Brooklyn‘s Saoirse Ronan), as she makes her way through her senior year at a Catholic high school in Sacramento. 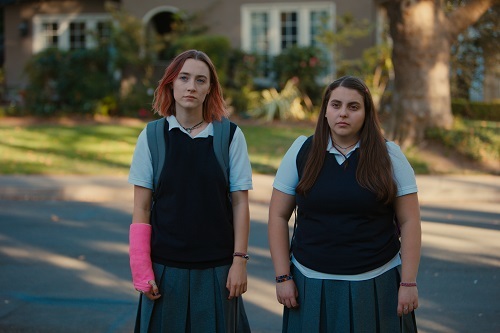 Lady Bird navigates her way through her classes, joins the drama club to impress a boy named Danny (Lucas Hedges from Manchester by the Sea), and tries to figure out her college situation with the help of her supportive father (Christine‘s Tracy Letts) and her less-than-supportive mother (Laurie Metcalf from “Roseanne”), all with her trusty best friend, Julie (Beanie Feldstein from Neighbors 2: Sorority Rising), by her side. That synopsis may sound uneventful, but Lady Bird is anything but. Between her classmates, friends, family, and the other people in her life, Lady Bird has plenty of drama to sort through, both self-inflicted and incidental. Greta Gerwig, who grew up in Sacramento, claims that her screenplay for Lady Bird is not autobiographical, but there’s a little of everybody in the lead character, male or female, Catholic or not. Anyone who has been through high school and had to grow up in social circles will relate to the type of drama in Lady Bird. Anyone and everyone. Gerwig’s voice emerges as very raw and genuine in Lady Bird, so the film is very honest and comfortable. Unlike Gerwig’s acting output, which tends to lean towards an improvisational “mumblecore” style, Lady Bird seems to be highly scripted and meticulously crafted. It’s not that it’s unnatural or inorganic, just that its rhythm flows in an almost poetic way that is sometimes absent from the impromptu guerilla style of filmmaking that audiences expect from Gerwig as an actress. Which means that Gerwig’s directorial voice differs from her performance one, and that’s good. It’s like audiences will get two different Gretas from here on out, and two is better than one, at least when we’re talking about a talent like Greta Gerwig. What Lady Bird essentially boils down to is a fresh coming of age story that is about both rebellion and conformity. While it doesn’t condemn Catholicism, it is a story of both busting out of and lashing out at the stifling institution of Catholic school. And the best part is that it never takes itself too seriously while it does it. It’s a very introspective movie, and it does it all in a very accessible way. The audience laughs, cries, and cheers at Lady Bird’s journey of self-discovery and growth. They also get to see her mother learn a few things along the way as well. Lady Bird is a masterpiece, but not in the way that people usually expect. The filmmaking is as flawed as the characters, and that’s what makes it so perfect. Like a performer who owns his or her mistakes, Lady Bird is unapologetic for its rough edges, which makes it all seem as smooth as glass. Lady Bird is being promoted as a comedy, and that’s a fair assessment, but it’s not a typical Judd Apatow-style comedy. It’s funny in a classic John Hughes kind of way, not full of brainless guffaws, but packed with intelligent chuckles. Most of the comedy is generated by the witty dialogue or the ridiculous situations, but the funniest scene is actually a physical comedy bit in the opening scene that is the type of thing that, while hilarious, makes the audience feel bad for finding it funny (that is to say that it involves injury, but no loss of life). But the whole movie has comedy like that; not really inappropriate, but not squeaky clean either. It’s humor that makes you think while you laugh.